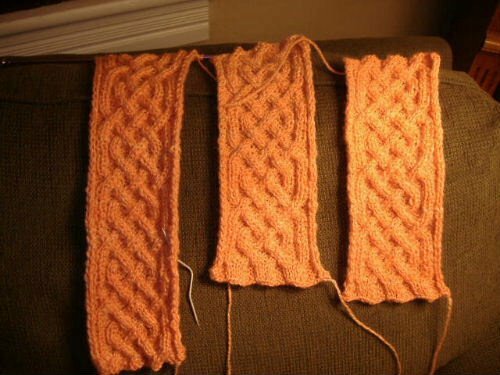 I didn't knit on Saturday but I decided yesterday to take an "intarsia break" and I worked a little on Kepler. I have the first waist band almost complete. These bands do go quickly and the pattern is fun to work. I still have plans to wear this to my daughter's baby shower in March. The baby sweater may have to take a back seat for a while but that won't matter. She won't be into that sweater for another year at least. 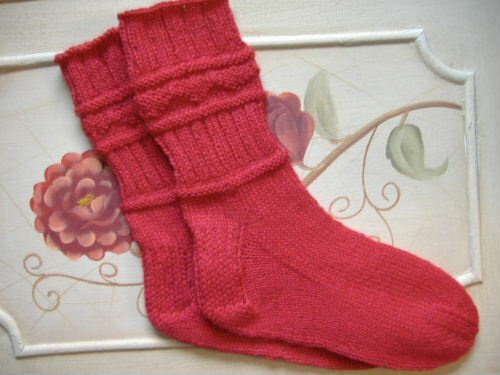 I finished the Valentine's socks yesterday. You can see the little hearts now since I blocked them. They turned out cute in spite of the fact that I misread the pattern and they aren't really supposed to look like this at all. And I really liked the Paton's Kroy sock yarn with a little nylon in it for durability. Message to Cate: I'm sure you want these. Sorry Charlie. :-) Not this time. I noticed the other day that the Maryland Sheep and Wool festival is on the same weekend that my husband and I were going to go to New York City. Lets see... NYC or MS&W... hmmn.... hmmn..... IT'S NO CONTEST! I'm going for the yarn!!! NYC can wait. What adorable socks! What is the pattern? I might have to make myself some for V-day.